Understanding the variation of recombination rates across a given genome is crucial for disease gene mapping and for detecting signatures of selection, to name just a couple of applications. 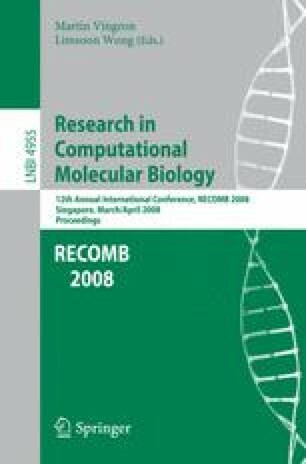 A widely-used method of estimating recombination rates is the maximum likelihood approach, and the problem of accurately computing likelihoods in the coalescent with recombination has received much attention in the past. A variety of sampling and approximation methods have been proposed, but no single method seems to perform consistently better than the rest, and there still is great value in developing better statistical methods for accurately computing likelihoods. So far, with the exception of some two-locus models, it has remained unknown how the true likelihood exactly behaves as a function of model parameters, or how close estimated likelihoods are to the true likelihood. In this paper, we develop a deterministic, parsimony-based method of accurately computing the likelihood for multi-locus input data of moderate size. We first find the set of all ancestral configurations (ACs) that occur in evolutionary histories with at most k crossover recombinations. Then, we compute the likelihood by summing over all evolutionary histories that can be constructed only using the ACs in that set. We allow for an arbitrary number of crossing over, coalescent and mutation events in a history, as long as the transitions stay within that restricted set of ACs. For given parameter values, by gradually increasing the bound k until the likelihood stabilizes, we can obtain an accurate estimate of the likelihood. At least for moderate crossover rates, the algorithm-based method described here opens up a new window of opportunities for testing and fine-tuning statistical methods for computing likelihoods.